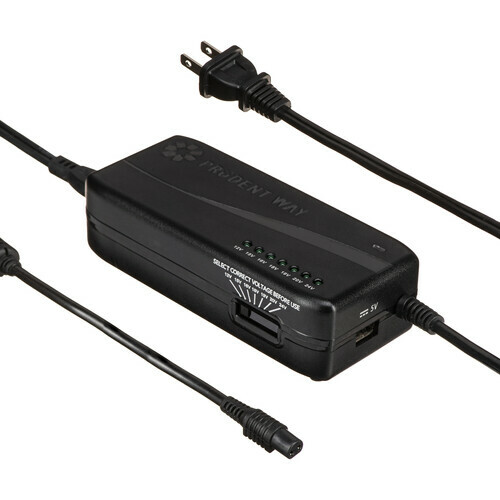 The Prudent Way Universal Notebook & LCD AC Power Adapter (90W) features adjustable 12 to 24V output design that fits specific notebook models. It includes 15 connectors including a 3-pin connector for Dell notebooks, a 4-pin connector for Toshiba and IBM, a 7.4 x 5 mm for Dell, and 7.4 x 5 mm for HP. Includes 15 tip connectors for use with most major LCD and notebook brands such as IBM, Dell, Toshiba, Compaq, Asus, Acer, HP, Sony, and more. Please see the manufacturer's website for a complete list of compatible models. Box Dimensions (LxWxH) 10.1 x 6.2 x 1.6"
Universal Notebook & LCD AC Power Adapter (90W) is rated 4.3 out of 5 by 7. Rated 5 out of 5 by Robertw from This is a great product. It's brought my laptop back to life! I searched all over for something like this. B&H had it. Next time, I won't search all over.. I'll simply go to B&H. I know I'm in Vermont, but you're right next to Penn Station and I've got daily train service from Northern VT. Can't beat it. Rated 5 out of 5 by Doulos of Jesus Christ from Great it works well. I forgot carrying my power transformer on my travel to New York. Hence, I went to B&H to find a transformer for my Samsung notebook computer. They recommended this power adapter and it works great. I love it. Rated 5 out of 5 by GB from Works well It works very well on my Dell e6440. You need to insert the power cord very forcefully into the brick. Rated 5 out of 5 by Able from Good price with flexibility Reasonably priced. Good extra power supply. fits all our laptops. does it work with the Asus VivoBook S15 S510UA-DS51 Notebook?